A water softener facilitates the removal of calcium, magnesium, and certain other metalcations in hard water. The resulting soft water is more compatible with soap and extends the lifetime of plumbing. Water softening is usually achieved using lime softening or ion-exchange resins. The presence of certain metal ions in water causes a variety of problems. These ions interfere with the action of soaps. They also lead to build up oflimescale, which can foul plumbing, and promote galvanic corrosion. To put it bluntly, if you have hard water, you need a water softener. The vast majority of US and Canadian homes have hard water—85% is the current estimate. Hard water is caused by calcium and magnesium in the water, and some folks have much more of these minerals in their water than others. There are things to look for to see if you need a water softener. For instance, if you have scaly, white deposits in basins or on fixtures in your bath or kitchen, you need a water softener. Additionally, water spots on glasses and dishes are another sign, especially if these spots don’t seem to go away. A water softener will eliminate these hard water spots. While hard water is a problem, it won’t harm your health, but it will harm your appliances and fixtures. Not only can hard water do damage to glassware and leave deposits in sinks and showers, it can decrease the life span of your home’s plumbing. Removing these with a water softener is the answer, and the harder your water is, with more calcium and magnesium, the more you will benefit from owning a water softener. What are the benefits of a water softener? A water softener will help prevent red, itchy or dry skin because there is no hardness to cause sore­ness, no soap curd to coat the skin. Shaving is easier, smoother—either with a blade or electric shaver when you have a water softener. You’ll use far less soap with a water softener. You will need to use your soap very sparingly—not as you did before you had a water softener. A quick rinse removes all lather, leaving your skin smooth and silky because now it’s free of sticky soap curd and film. With a water softener your clothes will wash whiter and cleaner with less soap or detergent. Because the hardness impurities are re­moved, your soap can concentrate solely on washing. People usually find that they can reduce the amount of soap they use substantially with a water softener. If you normally use a cup per wash load with hard water, try using 1/3 cup depending on the size of your wash load and the degree of soil after getting tour water softener. Different amounts are required, but you can use less with a water softener. An added bonus is the fact that your washable fabrics will last longer. Water from a water softener is great for scalp and hair care. No insoluble deposits are formed. Hair is shinier, softer, more manageable. Reduce the amount of shampoo you have normally used. With a water softener, dishes washed by hand or in a dishwasher are much easier to clean. A water softener promotes sanitation because no greasy hard water film can form or hold bacteria. You’ll be amazed at how much easier house work is after you get a water softener. Just a wipe of the cloth, and the bathtub or shower and fixtures are clean and sparkling. No more scouring! With a water softener you will have no hard water scum to cause rings, streaks, spots and stains. To keep their gleaming luster, simply wipe fixtures with a towel after use. Formica, tile, walls, floors, woodwork surfaces clean easier, stay clean longer with a water softener. You’ll save on cleaning products and time with a water softener. A water softener reduces the formation of rock-like hard water scale that encrusts water heaters, hot water pipes, shower heads, and water-using appliances. This scale will cause premature maintenance and failure. A water softener also provides substantial energy savings because scale acts as an insulator, wasting electricity or gas used to heat water. Why Water Gets Hard And How It Is Softened by a water softener. All of the fresh water in the world originally falls as rain, snow, or sleet. Surface water is drawn upward by the sun, forming clouds. Then, nearly pure and soft as it starts to fall, it begins to collect impurities as it passes through smog and dust-laden atmosphere. And as it seeps through soil and rocks it gathers hard­ness, rust, acid, unpleasant tastes and odors. Water hardness is caused primarily by limestone dissolved from the earth by rainwater. 1. Dissolved Iron—Also called ferrous or “clear water” iron. This type of iron can be removed from the water with a water softener by the same ion exchange principle that removes the hardness elements, calcium and magnesium. 2. Particulate Iron—Also called ferric or colloidal iron. This type of iron is an undissolved par­ticle of iron. A water softener will remove larger particles, but they may not be washed out in regen­eration effectively and will eventually foul the ion exchange resin. An iron filter will be required to remove this type of iron before the water enters the water softener..
3. Organic Bound Iron—This type of iron is strongly attached to an organic compound in the water. The ion exchange process alone cannot break this attachment and a water softener will not remove this type of iron. 4. Bacterial Iron—This type of iron is protected inside a bacteria cell. Like the organic bound iron, it is not removed by a water softener. When using a water softener to remove both hardness and dissolved iron it is important that it regenerates more frequently than ordinarily would be calculated for hardness removal alone. If you are operating a water softener on clear water iron, regular resin bed cleaning is needed to keep the bed from coating with iron. Even when operating a softener on water with less than the maximum of dissolved iron, regular cleanings should be performed. Clean every six months or more often if iron appears in your conditioned water supply. Use resin bed cleaning compounds carefully following the directions on the container. The control valve automatically performs a variety of tasks that are necessary for the proper operation of your water softener. These tasks, commonly referred to as cycles or operating positions, are Service, Regeneration, and Brine Refill. 3. Brine Refill: While the control valve is in the brine refill cycle, a predetermined amount of water is directed to the salt storage tank of the Brine System so that the correct amount of salt can be dis­solved to provide the brine solution that will be needed for the next regeneration cycle in the water softener. The water softener mineral tank contains the resin. The number of gal­lons of hard water a water softener can soften through the resin before it needs regeneration is called the “capacity” of the water softener and depends upon the amount of hardness minerals in each gallon of water (expressed as grains per gallon) and upon the amount of regenerant (brine solution) passed through the resin during regeneration of the water softener. We program each water softener carefully to established how often the water softener will regenerate and how much salt will be used for each regeneration. This will ensure that all of your soft water needs will be met without using an excessive amount of salt used by your water softener. The Brine System of a water softener consists of a salt storage container and float valve. The salt storage con­tainer holds the salt that is used to make the regenerant brine solution within the water softener. The float valve limits the amount of water that goes to the salt storage tank during the brine refill cycle in the water softener. Because a predetermined amount of salt is dissolved during each brine refill cycle, the salt must be replenished in order to maintain efficient operation of your water softener. A water softener facilitates the removal of calcium, magnesium, and certain other metal cations in hard water. The resulting soft water is more compatible with soap and extends the lifetime of plumbing. Water softening is usually achieved using lime softening or ion-exchange resins. The presence of certain metal ions in water causes a variety of problems. These ions interfere with the action of soaps. They also lead to build up of limescale, which can foul plumbing, and promote galvanic corrosion. 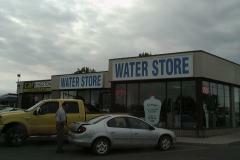 made when purchasing water treatment equipment and how you can avoid them.